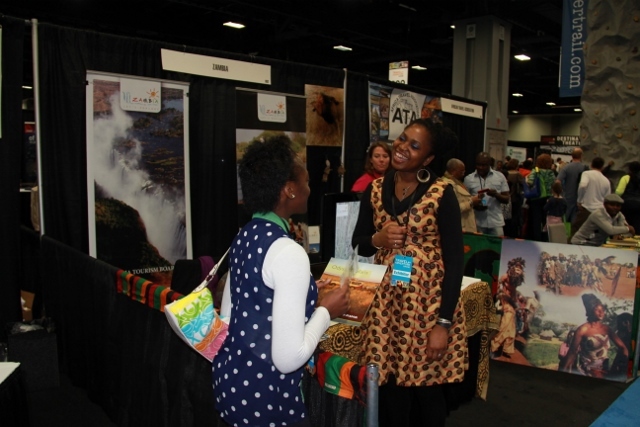 ﻿ Zambia Attracts 800 Visitors at Travel Show | Embassy of the Republic of Zambia in Washington, D.C.
First Secretary, Tourism shares a joke with a visitor to the Zambia booth at the Travel and Adventure Show in Washington, DC. 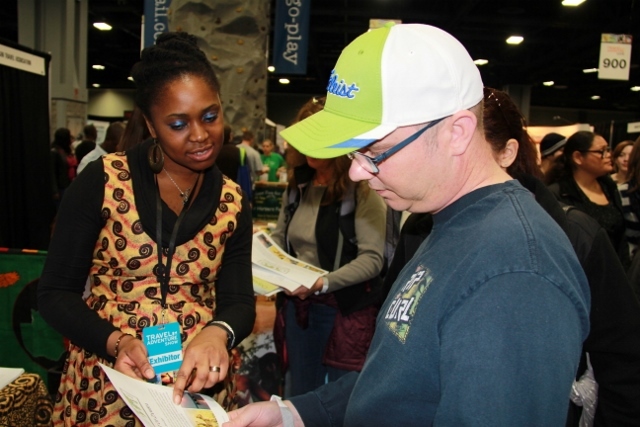 February 25, 2014 - The Zambia booth has recorded an estimated 800 visitors at the just ended 10th Annual Travel and Adventure show held at the Washington Convention Center in Washington DC. 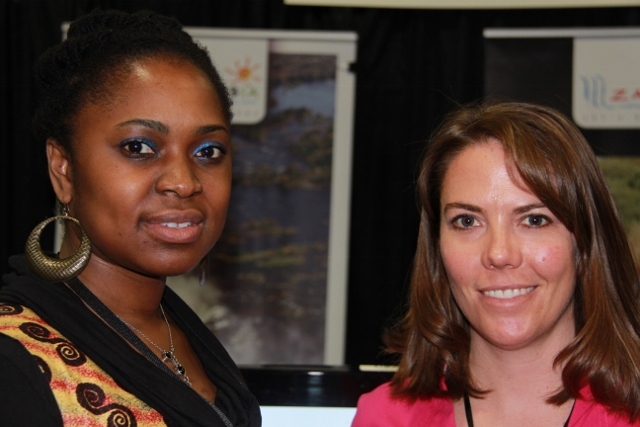 According to Ms. Marsha Holdway, the First Secretary for Tourism at the Zambia Embassy, the two day show that was held from the 22nd – 23rd February, 2014 provided a perfect platform for Zambia as a last preferred destination for tourism. The show provided a one stop shopping bazaar with a huge number of tourist vendors offering show only travel deals to destinations to all the five continents. The Zambia Embassy booth was manned by First Secretary at the Zambia Embassy in Washington Marsha Holdway and Katie McDonough, the Custom Travel Specialist from Explore Incorporation, a company that specializes in African custom safaris in Zambia. According to the First Secretary for Tourism at the Zambia Embassy in Washington DC, Ms. Marsha Holdway, the Zambian booth won an estimated 800 visitors out of 1,500 booths. "About 750 organizations and companies participated as exhibitors from over 120 countries," she said. Weighing in on the travel show, Katie McDonough noted that most of the people that visited the booth expressed an interest in an African Safari in Zambia after watching a slideshow depicting the country's tourist attractions. This, they said, was a thing they had never considered before. "What we were highly successful in achieving today is an increased awareness of Zambia as a viable destination of tourism, adding," I am certain that this will result in actual bookings, whether through Explore Incorporation or through other operators," she said. She highlighted the importance of having presence in the world's travel shows such as the World Travel Market (WTM) held in London, the ITB Berlin (Internationale Tourismus-Börse), PURE Marrakech in Morocco and Indaba in South Africa, if Zambia is to benefit greatly from the tourism industry. Zambia's representation at the show was prominent and remains an ideal platform and opportunity for Zambia to get her message to the general public, the tourism professionals in which they can establish lines of action, strategies and business alliances.